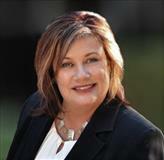 To search MLS Home Listings for El Segundo, Click Here. El Segundo is a tale of two cities. The residential neighborhood bordered by Imperial Highway to the north, Sepulveda Boulevard to the east, El Segundo Boulevard to the south, and the ocean to the west, has a rural feeling to it, with a very home town "Mayberry" quality. The neighborhood has many tree lined streets and feels far removed from the LAX airport immediately north, the commercial and industrial part of the city east of Sepulveda Boulvard, and the Chevron refinery to the south of El Segundo Boulevard and east of Sepulveda Boulevard. 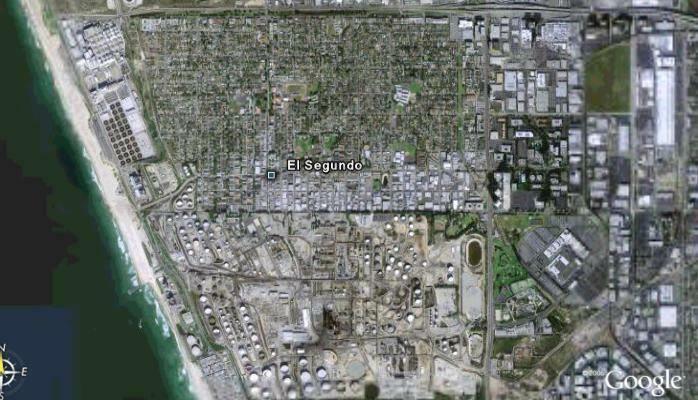 El Segundo has an interesting history. The citizens of El Segundo are proud of its relatively small residential community, its excellent schools, and enjoys a strong tax base due to its commercial, office and industrial base. It also enjoys easy access to the LAX airport. El Segundo Map, bordered by Imperial Highway (with LAX Airport to the north), Aviation Blvd. to the east, and Rosecrans Blvd (with Manhattan Beach to the south). The area bordered by Imperial Highway, Vista del Mar, and Grand Avenue to the west of the residential area of El Segundo (in the northwest quadrant of the city) is the location of the Hyperion Treatment Plant, which is owned by the City of Los Angeles and treats the waste water for the City of Los Angeles. 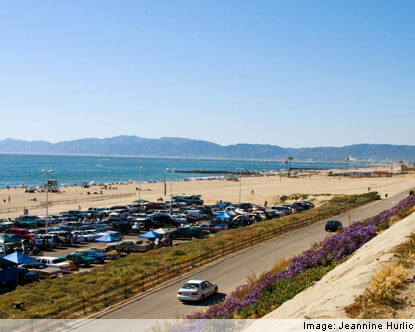 Dockweiler State Beach is just to the west of the Hyperion Treatment Plant, and El Segundo Beach is south of Grand Avenue and north of Manhattan Beach. The Chevron refinery is bordered by Rosecrans on the South, Vista del Mar on the west, Sepulveda Boulevard on the east, and El Segundo Boulevard on the north. The City has numerous neighborhood parks, the largest of which is El Segundo Rec Park, which includes several baseball fields. The city also has a teen center, a skateboard park,a dog park and runs an extremely active youth sports program. This includes little league baseball, soccer, tennis, ice hockey and ice skating. 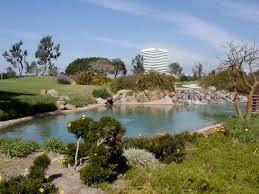 Golf is available at the Lakes Golf Course on Sepulveda Boulevard. This course is a nine hole executive course, with a restaurant facility and driving range. Resident Golf passes may be purchased by residents for $32 per month. The City of El Segundo does have a performing arts center at the El Segundo High School, and there are numerous other arts and cultural facilities in the South Bay within an easy drive. These would include the Arts and Perfoming Center in Redondo Beach, the Torrance Cultural Arts Center, and the Norris Center for the Performing Arts in Rolling Hills Estates. Numerous other Arts and Cultural centers are located in the City of Los Angeles including the Dorothy Chandler Center and the Disney Philarmonic Center in downtown Los Angeles, the Pantages Theatre in Hollywood, numerous museums including the Getty Center in West Los Angeles, the Museum of Art in the Fairfax area, the Museum of Contemporary Art in Downtown Los Angeles, as well as several smaller performing arts venues in Westwood and the Hollywood area. Property Taxes:The property tax rate for the fiscal year 2011-2012 is 1.071697% (computed by the standard 1.0% of the property's assessed valuation (in accordance with Proposition 13, a property's assessed valuation is the original purchase price, plus the cost of improvements, based on the value of permits pulled, plus an increase in valuation of 2% per year) plus additional tax rates for voted bonded indebtedness) plus direct assessments of $200-$300 per parcel for other misc. local taxes. The City has its own Police and Fire Departments.